Ergonomics is a commonly overlooked aspect of operations no matter what industry you are in. You surly know the impact poor ergonomics can have on the well being of your employees. Improving your employee’s well being has a cascading effect on operation efficiencies and cost that are not commonly associated with ergonomics. Ergonomics is the scientific study of people’s efficiency in their work environment. In other words, it is the fitting of jobs and tasks to the workers that fill them. Ergonomics utilizes engineering, physics, psychology, human physiology, and business management to impact systems and organizations. The common perspective of ergonomics is your mouse conforming to your hand, this seems like an odd definition. The true purpose of ergonomics is to be able to make workers as efficient as possible. The health benefits are part of that. In panel building, it is human workers, not machines, that build the control panels. Since this form of manufacturing is heavy on human capital, ergonomics plays a key role in the quality and cost of our panels. That statement may sound farfetched, but there is more to this than one may think. Ergonomics is important to the quality of our panels for two main factors: worker psychology, worker abilities. If we have employees that are in pain for most of the day, this pain is a distraction to their primary tasks. Now putting this in the perspective of a panel builder, when they are wiring your panel and their back hurts, they are not fully attentive to the task at hand. When their back hurts and they are reading the drawings, that could be even more costly of a distraction. Ergonomics is also impacting quality because of the worker’s abilities. If there is no ergonomic way to reach specific parts of the panel without aggravating a chronic pain for a worker, it is likely that those components are not installed up to IPS’ stringent standards. If there are tight spaces that require an awkward position to get into, the quality of that installed component might be less than exceptional. The cost of panels is directly correlated with the amount of time spent fabricating them. When workers are not able to work as efficiently as they can, or they become fatigued often, this correlates to more time that in not spent making panels. You do not need to be told what that means. Additionally, when workstations are set up ergonomically employees will be able to work more efficiently by reducing the number of motions that they may need to do to accomplish a task. In another perspective, say that you suffer an injury from poor ergonomics that causes you to go on short term disability. There are a bevy of costs that will pile up both for the employee and employer, which will be passed down stream to the customers of said business to keep the business around. Luckily for our customer, IPS makes ergonomics a priority because of the sweeping impact that it has through the organization. Through IPS’ ergonomics initiatives, we have created three back panel stations and have purchased a Rittal assembly frame. These three stations shown below allow panel fabricators to work in an upright position. 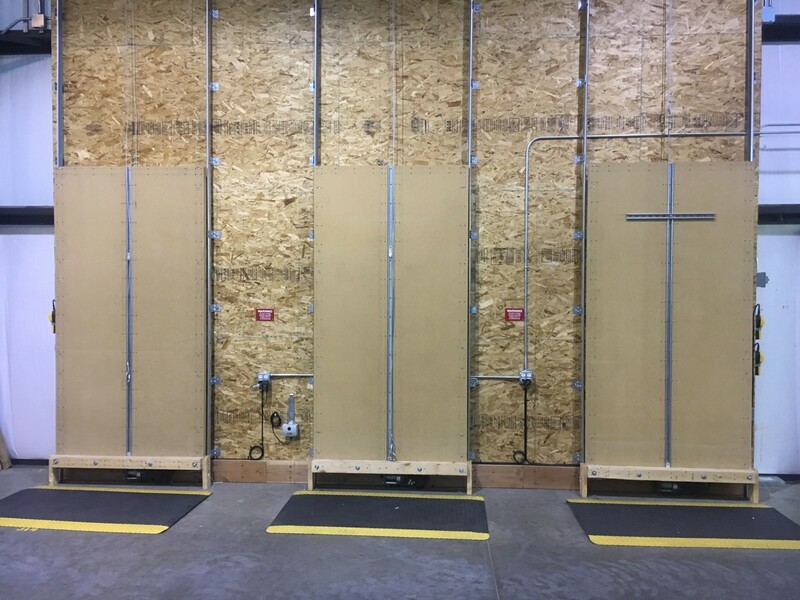 Traditionally when fabricating back panels, panel fabricators would be working on a level surface that requires them to lean over the panel for hours at a time. This causes significant stress on the individual’s back, neck and shoulders. These assembly stations are also height adjustable which reduce the strain on shoulders of panel fabricators. This is accomplished by keeping their reach close to their bodies and below the shoulder line. Fabricators adjust the height of the fixture by using an electric winch that lifts or lowers the panels to the optimal height for the fabricator. 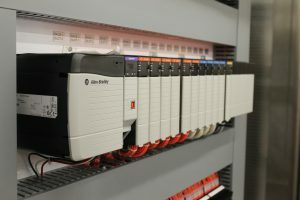 This fixture that IPS recently bought is an amazing piece of equipment and aims to solve the same issues as the back-panel assembly stations. The assembly frame allows for large panels to be fixed to the frame and moved along many axes. The amount of movement possible with this fixture allows the panel to be place in the optimal working position for operators of many heights. This fully adjustable assembly station is awesome to see in action. 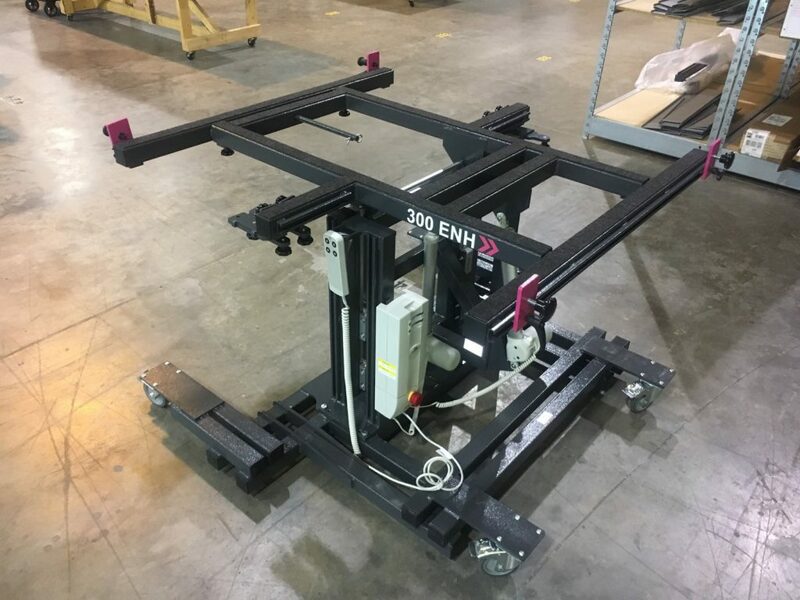 In addition to being just plain cool, the fixture is extremely functional as it allows for panels to be easily transported and maneuvered for easier loading and unloading when it comes time to package the final panel. These ergonomic investments are beginning to show their value as our employees are adopting the fixtures in their work. With the implementation of these fixtures, our employees should have an increased sense of wellbeing in addition to less downtime and more productivity. For our customers this means shorter production times, lower cost and a higher level of quality.